Bank locker is the safest place to store valuable items like cash, necessary documents, and jewellery along with other precious things. The risks and threats of the expensive items getting stolen reduce. Several banks offer locker facilities. It is not that easy to open a bank locker. Before beginning one, you need to do a lot of homework. The bank takes the responsibility of keeping the customer's assets secure. The customers have to pay modest charges to the bank. Fees for the bank lockers vary with size. If you have an account with State Bank of India, it is preferable for you to open a cabinet at your home branch. Before you open the locker, learn about the SBI Locker charges 2018. For Small sized lockers, the customers in the Urban and Metro cities will have to pay Rs 1500 + GST while the customers in the Rural and Semi-Urban areas will have to pay Rs 1000 + GST. For the Medium sized lockers, the Urban and Metro customers need to pay Rs 3000 + GST and the Rural and Semi-Urban customers need to pay Rs 2000 + GST. The rent charges for the Large-sized lockers is Rs 6000 + GST for the Metro and Urban customers while the rent charges for Semi Urban and Rural customers is Rs 5000 + GST. 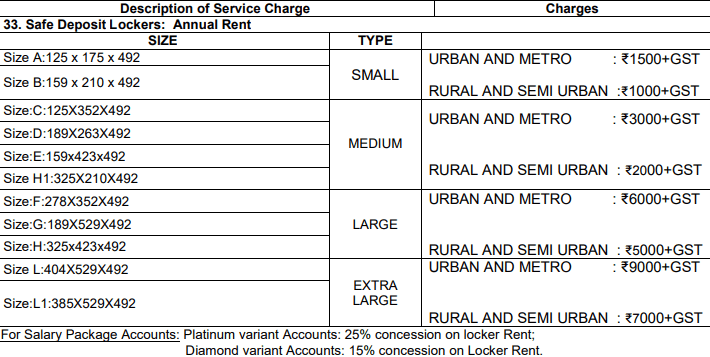 SBI charges for Extra Large sized lockers is Rs 9000 + GST for the Metro and Urban customers while for the Semi-Urban and Rural customers the rent charge is Rs 7000 + GST. SBI Charges one-time locker registration fees. For small and medium-sized lockers, SBI charges Rs 500+ GST while for the Large and Extra Large lockers the charge is Rs 1000 + GST. 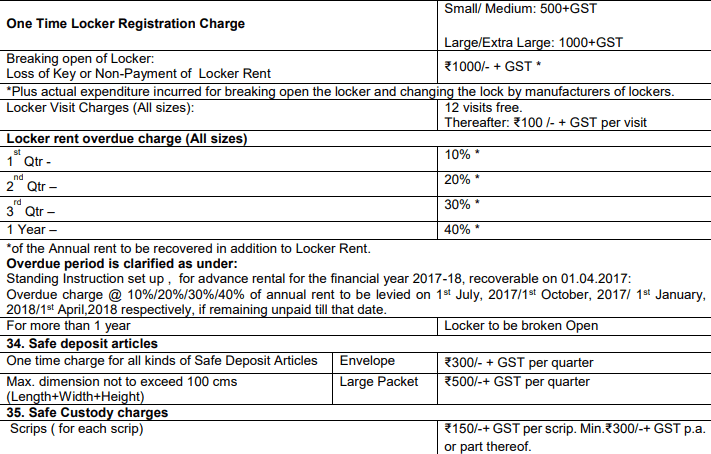 If you lost the locker key, you need to pay a fine of Rs 1000 + GST. If you are defaulter customer not making payment for locker rent, you need to pay R,s 1000 + GST. The bank would charge extra expenses for breaking open the locker and replacing a new lock if in case you lost the key. SBI offers 12 visits free, but customers have to pay Rs 100 + GST every time they visit after the end of free visits. In every section, i.e., Small, Medium, Large and Extra Large, SBI offers lockers with varying sizes. The locker users need to pay the rent charges annually. SBI provides concession on the locker rents for variant accounts. Select the appropriate locker size and keep your valuable items safe. Visit the SBI Bank and discuss the facilities and terms before registering a locker. Is there any fewer charges for a locker for an ex-defence personal account. I had a locker in Kovipudur Coimbatore (SBI) and I recently closed it. But they refuse to refund rent for the availed period; I paid rent in advance for the full year and after 3 months I closed it. I requested them to pay the proportionate rent on my locker for unavailed period of 9 months. please clarify and let me to whom the problem can be addressed. SBI, Kanjikuzhy, Kottayam is a semi-urban branch. But the branch is charging urban branch rental rates for its lockers. Please check.